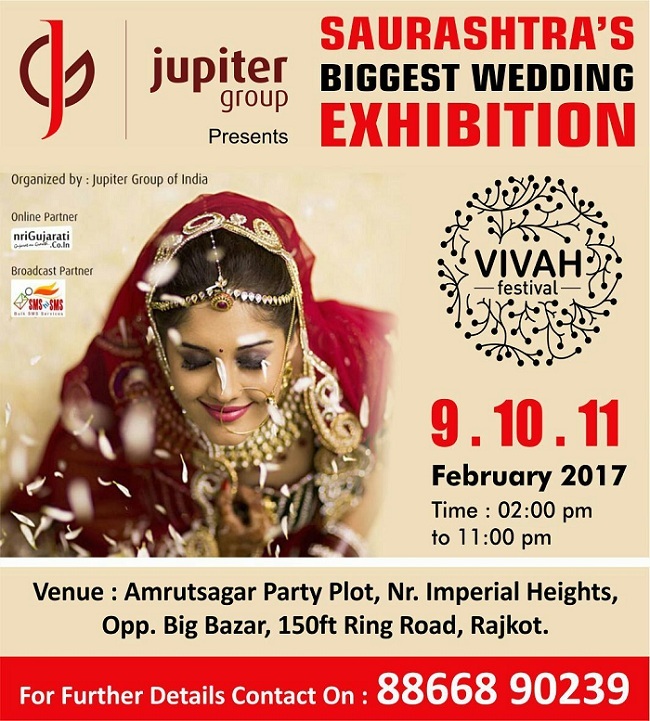 Jupiter group is the fastest growing Lifestyle exhibition & wedding product now it is coming with Vivah Festival for the first time in Rajkot. Vivah Festival 2017 will be organized for 3 days. The Grand Wedding Exhibition Vivah Festival 2017 is going to held on 9, 10 and 11 February 2017. The Exhibition will highlight exclusively costume and other accessories for bridal wedding. Vivah Festival 2017 venue is at Amrut Sagar Party Plot Rajkot. Be ready for the latest fashion shopping for upcoming marriage season. Vivah festival most splendid and unique wedding exhibition. Join us and widen your horizon for a dream wedding. Vivah festival has all collection of outfits for Indian traditional wedding with accessories. Wedding, fashion & lifestyle exhibition in Rajkot Gujarat. 2017 The Grand Wedding Exhibition will be one of the biggest Exhibitions from 9th to 10th February 2017 in Rajkot is a platform for Honeymoon Destinations, Precious & Semi Precious Jewellery, Diamond Jewellery, Spas, Salon, Cosmetics, Perfumes, Bridal Trousseau Couture, Ethnic, Wedding Cards and much more things for marriage. 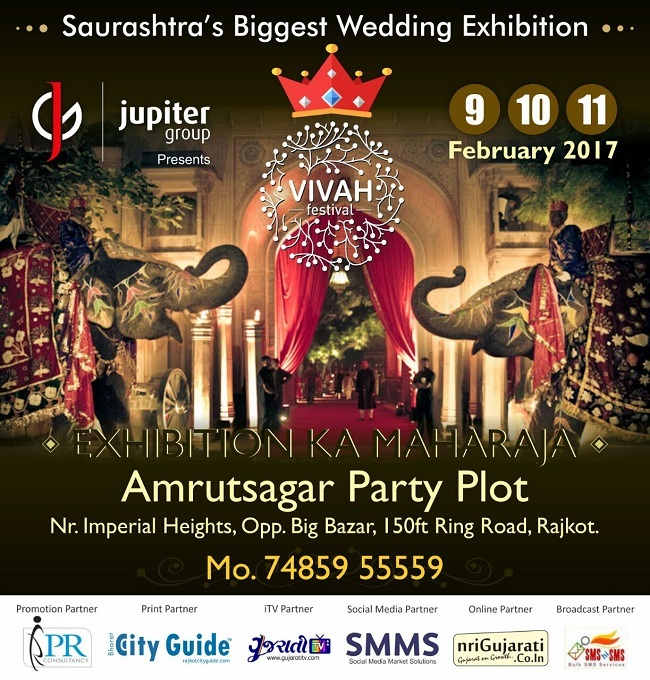 Jupiter Group presents The Grand Wedding Exhibition 2017 in Rajkot at Amrut Sagar Party Plot. Rajkot Vivah Festival 2017 with fun world & food zone for the entertainments. All are invited to come and buy lots of things from the Wedding Vivah Festival 2017. Vivah Festival 2017 Rajkot will showcase Elegant Fashion Accessories & Jewelry, Men's Fashion, Stone & Silver Jewellery, Wedding Accessories, Traditional & Fashion Jewellery, Home Decor Items and Handicraft Items, Hotels & Resorts, Wedding Planner, Fashion Designers for Bridal wear etc.